A torsion spring runs across a bar at the top of the inside of the garage door. The spring is wound and under immense tension. It's the tension of the torsion spring that lifts the weight of the garage door. 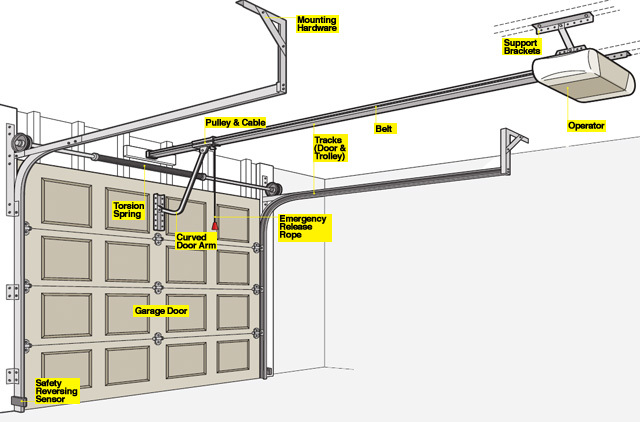 You can easily perform some garage door system safety and maintenance tasks yourself. If you are not comfortable performing these tests, have them performed by a trained service technician. When your garage door won’t open, you need reliable experts who can get the problem solved quickly . 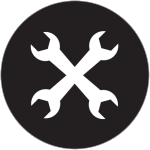 Each of our garage door experts is professionally-trained and capable of fixing your problem with the right tools and parts. Want a new garage door?! Making the right decision on which garage door to buy is all about finding an appropriate balance of quality, cost, appearance, functionality, safety and durability. When it comes to garage door and opener service in Toronto, ON, Express Garage Door Repair can repair all of them. We’ve got a lot to provide you, as part of our excellent collection you can find, Commercial metal doors, Custom made carriage garage doors, Garage door installation, Garage door openers, Garage door repair, Garage spring replacement and much more. A great looking and well-functioning garage door won’t only add a terrific aesthetic to the look of your home, it could possibly add to its value too. We’ve got a huge selection of residential garage doors which are designed for the very best in functionality and effectiveness. If you need assistance together with the installation of a brand new garage door, or need different door openers to your existing unit, you can rest assured that our team is standing by and ready to get it done for you, anytime through the day 24/7. Just give us a ring at (647) 277-1182 and we’ll be right there for you. No matter if it is garage door installation, maintenance or even items replacement, we’ve got the ways to get your job done to your full fulfillment. Toronto Garage Door Repair have incredibly professional technicians and every one of them is insured and licensed. Our own staff takes very good pride in every single door we setup and that we always happy to see the smiles of our own pleased customers once they look at their brand new garage door placed on their houses. We’re a full services licensed shop, and have the proper insurance coverage for your restoration or construction project. 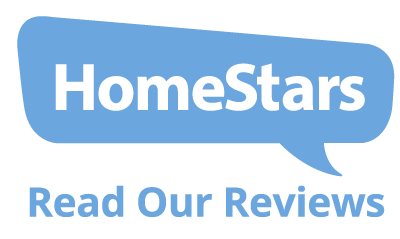 We can personally meet up with you to review the plans for one’s garage door building project to ensure we get what you wish. All of our workers are timely, polite and proficient. Toronto Garage Door Repair is considered the leading garage door supplier and repair company in Toronto, ON having a very long popularity for taking care of all garage door brand names. Our experienced and licensed techs are always ready to give you a timely respond and cost-effective repair service any time throughout the day. We will repair or replace a busted garage door component that you might have, our techs have entirely equipped cars so they’re able to fix the problem in just matter of moments. On many occasions, if you have a problem with your garage door and it appears like a little problem, you don’t wish to pay a ton of money to repair it, and so you simply leave it like this if it’s not essential, but it can be very vital that you fix it as quickly as possible, otherwise, a major affect would happen to your own garage door. Oftentimes once the customer feel that the problem is the opener or even the springs, the experts show up to the spot so when they investigate it, it is extremely easy issue that doesn’t cost too much. Our own techs will assure you understand exactly what they are doing in your garage door, like this you’ll know what the procedure is. We employ only proficient techs which may solve your garage door inquiries in the same day you phoned us, because we know how irritating it is when the garage door trapped or not functioning properly. We also provide 24/7 services for cases you’ve got an emergency situation and then you might need our service as quickly as possible, don’t hesitate to give us a call at (647) 277-1182.